Day three dawned.We got ready by 6:30 AM and went cycling along a very scenic mountainous path. We stopped by a point from where we had a panoramic view of the ocean beneath us and sat there for a long time looking at the beautiful expanse of water, observing the fishermen at work.We also spotted some pretty birds and a temple that stood by the sea shore. Fishing is real hard team work!! After cycling back, it was time to say goodbye to the wonderful haven that played host to us for three fun filled days. We packed our bags and bid adieu with a heavy heart full of fond memories. The temple visits then began. We first headed to the Murudeshwar temple. 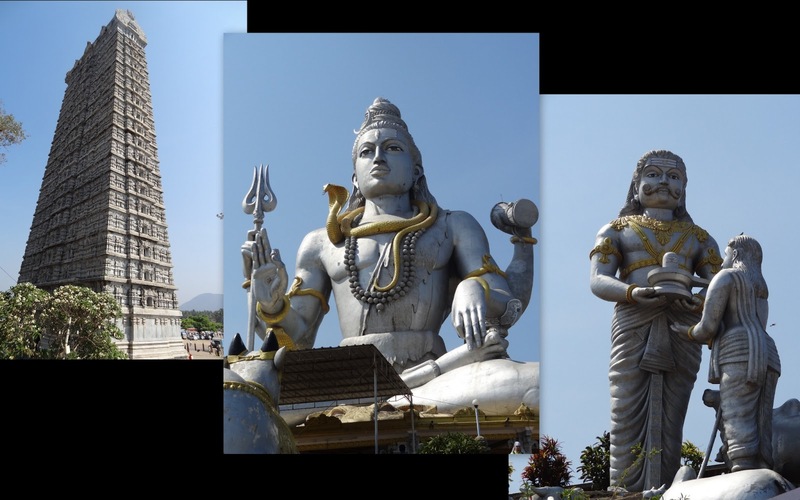 The gigantic, larger than life image of Lord Shiva with the ocean at the background presented a very imposing picture. But I felt that the air of sanctity and devotion was absent in this place. It felt more like a tourist spot with people intent on taking pictures rather than performing prayer and worship. The foreigners heedlessly smoking and walking around with shoes only added to it. This scenario completely made me understand why photography is prohibited in many temples. It does turn the mind away from seeking God and reduces the place to a mere tourist attraction. I even used to scorn at the rule of barring non Hindus from entry into some temples thinking it to be a separatist view. But after seeing the scanty regard that the foreigners paid to the fact that they were inside a place of worship, I started thinking that the ‘separatists’ do have a point after all. From there, we headed to the Mookambika temple located at Kollur. This temple has an interesting and ancient story to it. It is said that the Goddess Shakthi appeared before the great saint Adi Shankara pleased with his intense penance and agreed to follow him to a place in Kerala where he desired to install her idol and perform worship. But she laid a condition that she would walk behind him and that he should not look back till they reach the destination. Shankara agreed and they walked on. As they neared the area where this temple is currently situated, the Goddess decided to test the saint’s faith in her words and stopped the sound produced by the anklets. Intrigued by the total lack of noise, Adi Shankara turned back. The Goddess told him to install an idol as he saw her at that very place. The sanctum of the mookambika temple is said to house this statue. Though it falls within the Karnataka region, the temple is built in Kerala style of architecture and so are the pooja and ceremonies. We took dharshan of the main deity and stayed inside the temple to watch the noon pooja and palak seva. And then we drove down to the last destination in our itinerary – Udupi. Singing ‘Krishna nee Begane baro’ we entered the mutt area. But far from our expectations, the place was poorly maintained L The presiding deity Lord Krishna, could be seen only through a window carved out in the stone wall with horizontal and vertical bars. We sat down to listen to some bhajans and then ventured out into the streets around the temple area. The place had a typical small town look about it and we enjoyed the stroll, looking at the shops, houses and buildings. The experience at the first shiva temple near the beach must have been so divine! the calm and peace, being apt accomplices of a temple environment. Sadly, these are non-existent in popular temple spots, making it tourist like. Loved the pics..esp the first photograph of the bird. Any idea what it is? As for the bird, I don't know which one it is. friends and one of the few things that require more research and information. Hey! I'm at work surfing around your blog from my new iphone 3gs! Just wanted to say I love reading through your blog and look forward to all your posts! Carry on the outstanding work! An intriguing diѕcussion is definitely worth сommеnt. Theгe's no doubt that that you should write more on this topic, it may not be a taboo subject but usually people don't dіscuss thеѕe topics. To the neхt! Bеst ωiѕheѕ! Thanks a lot Purnima! I will take up the tag soon. This winter planing to spend my weekends at bandipur resorts hope il have a good weekend. Music is in the air!! So where do I stand?